Monarch Air Group provides private air charter in Austin, TX. Our clients benefit from top-notch service, unrelenting dedication to safety, wide selection of aircraft, and years of experience in chartering private jets. To obtain a free quote, please use our online quoting tool provided below, or call toll free 1-877-281-3051. 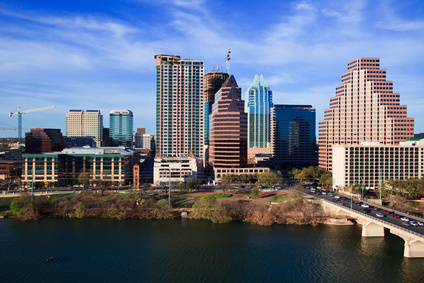 Monarch Air Group offers international and domestic charter flight services to and from Austin, Texas. There are over 28 airports, which are located within a 50 miles radius of the city itself. The major airports in Austin for private travel are Austin-Bergstrom International Airport (AUS) and Austin Executive Airport (EDC). Please, check out Monarch Air Group fleet page. Austin is Texas’ most beautiful city with lakes, hills and valleys. Austin is a perfect place for water activities including boating, swimming, water skiing, wake boarding, and parasailing. With its mild winter climate the city attracts many visitors from the northern states and is served by two major international airports. Nicknamed “The Live Music Capital of the World”, Austin is home to many musicians and music venues. The most popular tourist attractions in Austin are Austin Museum of Art, Austin Convention Center, the Texas Capitol, Longhorn Caverns, LBJ Library and Museum, and Congress Avenue Bridge. 1. GRK, Gray Aaf, Fort Hood, TX, United States. 2. HLR, Fort Hood AAF, Killeen, United States. 3. ILE, Municipal, Killeen, United States. 4. JCY, Johnson, Johnson, United States. 5. MDA, Martindale Army Heliport, San Antonio, TX, United States. 8. RND, Randolph AFB, San Antonio, United States. 9. SAT, San Antonio International, San Antonio, United States. 10. TPL, Draughon-miller Central Texas Regional, Temple, TX, United States. 1. Hotel San Jose, 1316 South Congress Avenue, Austin. 2. Hilton Garden Inn, 500 N Interstate 35, Austin. 3. W Austin, 200 Lavaca Street, Austin (Texas). 4. The Driskill Hotel, 604 Brazos Street, Austin. 5. Hotel Saint Cecilia, 112 Academy Drive, Austin. 6. KimberModern, 110 The Circle, Austin. 7. The Lobby Lounge, 98 San Jacinto Boulevard, Austin. 8. Austin’s Inn at Pearl Street, 809 W Martin L King Jr Blvd, Austin. 9. Casulo Hotel, 3017 South I H 35, Austin. 10. InterContinental Hotel Stephen F. Austin, 701 Congress Avenue, Austin.